A United Launch Alliance Atlas 5 rocket carrying the NROL-33 satellite launches into space from Cape Canaveral Air Force Station in Florida on May 22, 2014. 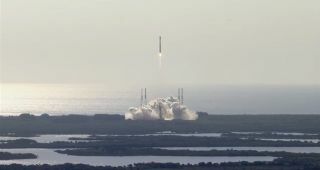 The mission will deliver a classified payload into orbit for the U.S. National Reconnaissance Office. An unmanned Atlas 5 rocket will launch a classified spy satellite payload for the U.S. National Reconnaissance Office at 9:09 a.m. EDT (1409GMT) from Cape Canaveral Air Force Station, and you could watch it live courtesy of Spaceflight Now. The United Launch Alliance Atlas 5 rocket will launch the NROL-33 satellite into orbit from Launch Complex-41 in Cape Canaveral. ULA will webcast live views of the Atlas 5 launch beginning at 8:45 a.m. EDT (1245 GMT). The launch posted for the NROL-33 spy satellite mission for the U.S. National Reconnaissance Office. The mission will launch on an Atlas 5 rocket on May 22, 2014. Space.com partner Spaceflight Now has a detailed preview of today's launch, which includes the controversy over the Atlas 5's Russian-built RD-180 rocket engines. The Russian RD-180 has made headlines recently due to the souring of U.S.-Russian diplomatic relations over the crises in Ukraine. Spaceflight Now will provide live minute-by-minute updates on today's launch via its Mission Status Center, which will also include a live webcast.